I’ve read some of Rebecca Bryn’s book and enjoyed them, so was delighted when she agreed to visit my blog to tell us about her latest book. The Dandelion Clock is my latest release and is set during the Great War, from 1914 – 1919, in Gallipoli, Egypt, Palestine, and England. It was inspired by something my grandfather confided in me just before he died, and I realised, much later, that there was a heartrending story there. The research was a real eye-opener, and the action is fact-based. I had no idea that men and mules froze to death in Gallipoli, drowned in trenches susceptible to flash floods, or died from dysentery, malaria, heat stroke, and dehydration in the Sinai Desert and the Jordan Valley on top of being shelled, shot at, and bombed. 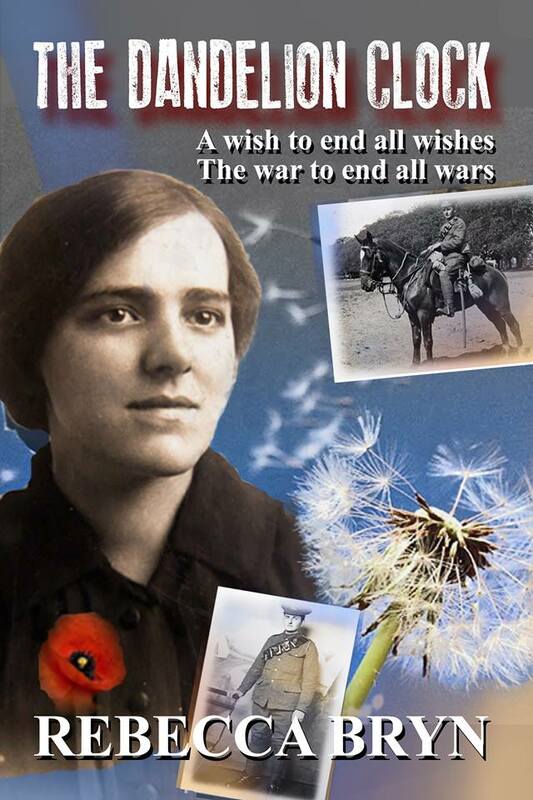 When Bill returns to England after the armistice in 1918, both he and Florrie have been changed by their personal journeys. Can their love survive five years apart and the tragedies they’ve endured? Will Bill keep his promises to Florrie and Lady Alice? A heartbreaking story of lovers torn apart by the Great War. An insight into the military history of the 1914 1918 war in Egypt as fought by the Royal Buckinghamshire Hussars and the Queen’s Own Worcestershire Yeomanry – some of the ‘PALS brigades’. Considered ‘not real soldiers’ by the regular army, the Royal Bucks and the Worcester Yeomanry fought with great courage and suffered huge losses. In fact, the Worcesters sustained more losses than any brigade in any war, and the PALS earnt the respect of all who fought. Although Military Fiction 1914 1918, it is a story inspired by real people and based on real events that doesn’t forget the role of women in the Great War or their need for a WW1 romance. 8,000,000 horses, mules, and donkeys died during the Great War, many from gunshot and gas, but many from exhaustion, thirst, and disease. https://www.horsetalk.co.nz/2011/12/16/true-story-britain-war-horses/ Their contribution to the war effort can’t be overestimated. Royalties also to http://www.thebrooke.org/get-involved/every-horse-remembered to honour the millions of horses, mules, and donkeys who didn’t come home after the Great War. The Dandelion Clock is available for pre-order at the special price of 99p/99c at http://mybook.to/DandelionClock until September 4th when it be £1.99/$2.99 so get it now. ‘It’s only a century since the first world war came to an end. It’s easy to forget that the conduct of warfare was then still heavily dependent upon horses. Cavalry regiments still formed the backbone of the British army. Bryn’s grandfather served in such a regiment and it is that fact that inspired her to write this epic tale. But she does not limit herself to the rigours faced by serving men. She takes a close look at the lives of those left behind in England. The older generation of men whose labours kept ‘the home fires burning’ and the women of all ages who shouldered the burden of clothing and feeding everyone whilst worrying about the fate of their young male relatives in far flung corners of the world. Another factor that sets this book apart from many others set in World War I is the way it concentrates on an often forgotten theatre of war. This is important because the events that Bryn relates reverberate a century later. After describing pre-war rural life, with shades of Downton Abbey, the story moves to the period of training that volunteer soldiers underwent. This enables Bryn to introduce us to a romantic triangle as her protagonist, Bill, and a young woman, Martha, with whose family he is billeted, develop a fondness for each other that leaves him agonising about his espousal to his sweetheart, Florrie, in his home town. The action then moves to the ill-fated expedition to the Dardanelles and, thence, to Egypt and the Holy Land. Through all the minor victories and set-backs that characterised these campaigns we see not only the suffering of the men but that of the horses. Copper, a horse belonging to Lady Alice, the daughter of the ‘big house’, is an important character in this story. Her suffering, and that of the other horses, will break your heart. Bryn has stated that she wept frequently whilst writing such scenes. It is that emotional engagement with the suffering of all her characters – back home in England the relationship between Florrie and her father goes from bad to worse to terrible – that makes Bryn’s writing such a roller coaster ride for the reader. Find out more about Rebecca Bryn’s writing by following the links below.